Bike tours begin at 10am and 3pm. Depending on the provider, these guided tours can take place once or twice a day. The bike tour of Paris is available throughout the year. The tour takes place on a daily basis from March to October or longer, depending on the chosen operator. We are comparing Best of Paris Bike Tour Prices from leading ticket suppliers and Try to find you Cheap tickets prices on the market. 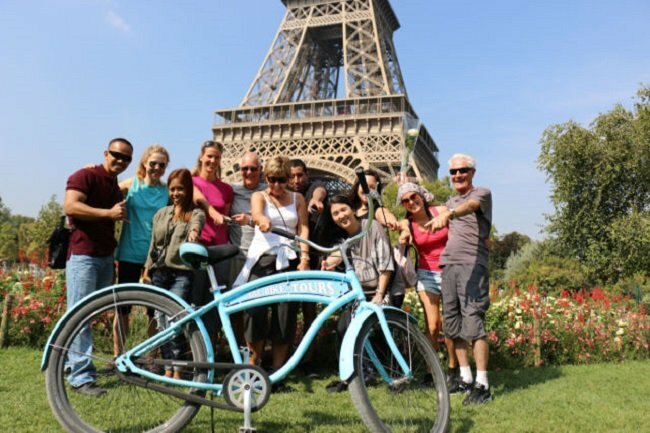 The Best of Paris Bike Tour is the perfect introduction to the city for newcomers and for anyone who would like to remind themselves of Paris. The French capital has many iconic monuments and landmarks famous throughout the world, and this guided tour allows you to discover most of them. Besides, the introductory bike tour of Paris will provide you with tips and insights how to experience the city best on your own during the reminder of your stay. Also, you will travel through the city in an efficient manner and discover its beautiful architecture, parks and riverside. You don't have to worry about the weather; as a participant of the guided tour, you will get anything you might need, regardless of weather conditions. Aside from biking in and around the downtown, you will listen to a knowledgeable guide conveying interesting stories. Furthermore, the tour provides opportunities for taking exceptional photos. This guided tour is ideal for everyone who wishes to tour top attractions of Paris in a short time. It is ideal for anyone who enjoys riding a bike. The tour introduces the city well, therefore it is the right choice for first-time visitors. Also good for fans of art and those wishing to learn more about Paris. Your Experience With Best of Paris Bike Tour? By joining the bike tour, you will explore the city of Paris and get your bearings in the French Capital. As you cycle around and appreciate the beauty of the "City of Culture," the friendly guide will share great insights about how to enjoy Paris for the best experience. You will hear interesting historical facts and stories about one of the most marvelous cities in the world. At certain places, the guide will make a stop for you to take postcard-perfect photos. Among other tourist attractions, you will see the Tour Eiffel, the Notre Dame, the Louvre, the Arc de Triomphe, Avenue Champs-Elysees and the Les Invalides. Also, you will paddle your way along the Seine River and spend some time at the outdoor market. What Best of Paris Bike Tour Includes? Enthusiastic, fun and knowledgeable tour guide. Rain gear or warm scarf and gloves (if needed). Complimentary seat for a child (if requested at the time of booking). Since Paris is mostly flat, an average fitness level sufficient for joining the tour. If you intend to visit the city by bike, take a tour first to feel the "pulse" of the city and how to act in the traffic. Travelers Reviews about Best of Paris Bike Tour? Rates of this bike tour of Paris are 4.8 on Get Your Guide and 5 on Viator. According to the existing comments, a bike tour of Paris is a great way of getting to know the city. Travelers highly commend the skill and the service provided by the guide. This guided tour isn't suitable for people with mobility difficulties. The cancellation policy is different from one tour provider to another. You can present either electronic or paper voucher to take part in the guided tour. In general, you are eligible for a full or partial reimbursement in the case of timely cancellation. Although you can get additional equipment suitable for current weather conditions, you should dress accordingly to the season. The bike tour is suitable for anyone who can ride a bike. Adults must accompany participants under 18 years in order for these to take part in the guided tour. Fontaine Saint Michel (Get Your Guide).